Studies indicate that one third of older adults have a fall at least once annually. Generally senior citizens fall due to a combination of having weakened leg muscles and encountering a slippery floor, uneven pavement or an unexpected change in a floor’s height, including unmarked stairs. When senior citizens fall they are more susceptible to suffering serious personal injuries, including broken hips. In fact, the United States’ elderly population accounts for almost ninety percent of all fractured hips each year. More than forty percent of all admissions to nursing homes are due to personal injuries and complications from falls. The statistics prove that almost twenty percent of elders who fall are admitted to a hospital to attend to their fractures, head trauma and cuts. Last year alone, that accounted for more than 700,000 senior citizens being hospitalized. 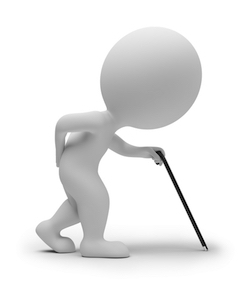 Studies demonstrate that women over the age of 80 are more likely to fall then men of the same age. Sadly, almost twenty percent of senior citizens who suffer a hip fracture from a fall down incident die within a year. If you fall and are injured due to a business’ negligence in failing to keep their property safe, you should immediately call Florida personal injury lawyer Joseph I. Lipsky to help you obtain the compensation you deserve. Because business owners may quickly correct the condition which caused a fall, it is imperative to immediately document why you fell. Considering most people carry smart phones, which have a camera, accident victims should take photographs of what caused their fall, or ask someone in the area to take a photograph if they are physically unable to. As with all personal injury cases, evidence is needed to prove the landowner or business was negligent. When possible, make certain to notify the owner or manager of the apartment building, store, restaurant or shopping mall of your fall, so they cannot later deny you fell on their premises. For over 23 years, Florida personal injury attorney Joseph Lipsky has helped senior citizens who are seriously injured in a fall down accident on someone else’s premises get the compensation they deserve for their pain and suffering, unpaid medical bills, home health assistance and transportation needs.